The Mallampati score is a simple test that can be a good predictor of obstructive sleep apnea. 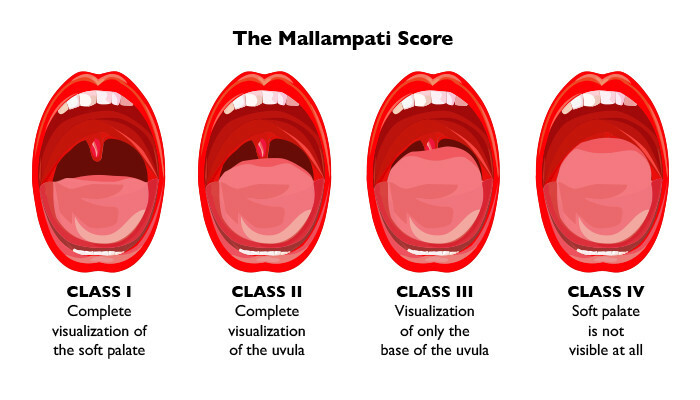 In anesthesia, the Mallampati score (or Mallampati classification) is used to predict the ease of intubation. It can also be used to predict whether a patient might have obstructive sleep apnea. I use the image in Figure 1, below, to show patients what I am seeing when I look at the back of their throats. The higher their score, the more likely they will have sleep apnea, although it is not 100% predictive. I use the Mallampati score every day in my physical examination of patients. In my experience, I have found it to be very predictive of apnea, and it is one of the easiest exams to do. The patient should be sitting upright with their head in a neutral position. Ask the patient to open their mouth and extend their tongue. Then look to see if structures can clearly be visualized in the back of the throat. I explain to my patients that we want to be able to see all the structures. A Class III or IV result means that it is simply easier for the patient’s airway to be blocked by tissue when they sleep, resulting in obstructive sleep apnea. If you see a patient with a Class III or IV airway who snores or is waking unrefreshed from sleep, I would suggest that the patient have a polysomnogram or at least be evaluated by a sleep provider. Diagrams like the one above can help identify the different classes and also be used to educate your patient. Of course, if you are a PA or NP doing surgery or anesthesia, this is a great tool as well! Sharon M. O’Brien MPAS, PA-C, is a practicing clinician with an interest is helping patients understand the importance of sleep hygiene and the impact of sleep on health. Nuckton TJ, Glidden DV, Browner WS, Claman DM. Physical examination: Mallampati score as an independent predictor of obstructive sleep apnea. Sleep. 2006 Jul;29(7):903-8.